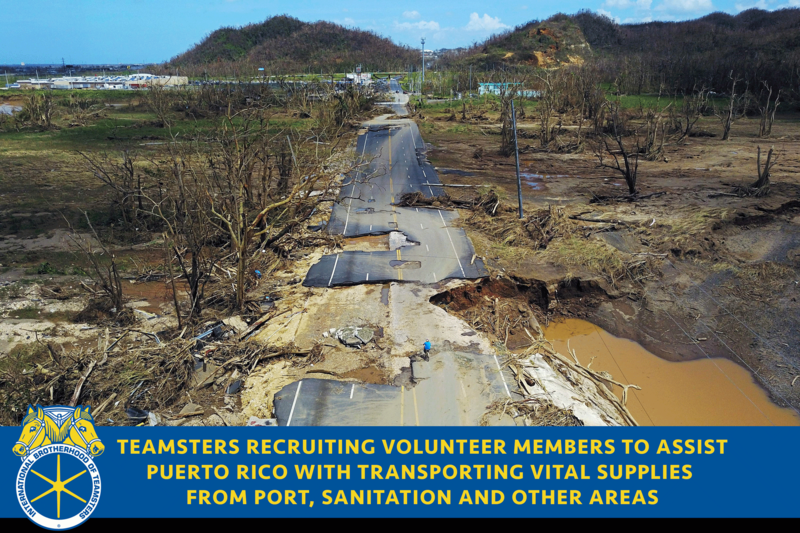 (WASHINGTON) – The International Brotherhood of Teamsters is working closely with Joint Council 16 in New York and the AFL-CIO to provide qualified volunteers to provide much needed support to the people of Puerto Rico. Teamsters Local Union 901 in San Juan, Puerto Rico, an affiliate of Joint Council 16, represents more than 2,000 working men and women across the island. “Our fellow Americans in Puerto Rico are suffering under unimaginable conditions wrought upon them by Hurricane Maria," said Teamsters General President Jim Hoffa. "We are working to identify ways in which the union and our members can best assist those in need." The Teamsters are joining with labor unions from across the nation to identify skilled workers to travel to Puerto Rico next week to provide much needed support in critical areas. “This is a humanitarian crisis of epic proportions," said Teamsters International Vice President and Joint Council 16 President George Miranda. "It is imperative that we provide the manpower and financial support necessary to get Puerto Rico on the road to recovery." “Tronquistas (Teamsters) are in the street working since the first day after the hurricane passed and we will continue working to bring peace back to our people,” said Alexis Rodriguez, Secretary-Treasurer of Local 901. “The only goal of the Tronquistas is to raise Puerto Rico back up, stronger and better." There is currently a need for volunteer truck drivers who hold a Commercial Driver’s License (CDL) to transport shipping containers from the port to distribution centers throughout the island. Additionally, the Teamsters Freight, Airline, Passenger Transport, Package, Public Services and Waste Divisions are contacting Teamster employers that operate in Puerto Rico and our local unions throughout the United States and Canada to identify avenues of support and volunteers. At this time, it is unclear if there are trucks available to move the containers, fuel to operate the trucks or road access to the distribution centers. However, the labor movement is working on the ground in Puerto Rico to bring volunteers to meet specific needs. Additionally, the Teamsters Disaster Relief Fund is collecting monetary donations to support those impacted by Hurricanes Maria, Harvey and Irma. Contributions can be made online at tdr.teamster.org.